Toby Moody analyses the reasons for Ducati's return to form, the already tense situation at Honda Racing, and the 2011 MotoGP calendar. For the first time since Valencia 2007 a Yamaha didn't get on the podium, and for the first time since Australia that same year, two Ducatis were on it. 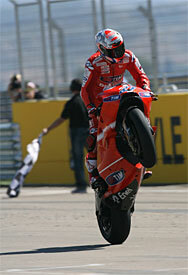 Where did that come from to bag Ducati's first win of the 2010 season? Whatever it was, they needed it because as Casey Stoner said after the race: "Misano was the worst race all year so for us to come back from that is great." Indeed, you could tell he was back on form because over three hours after the race, the Aussie was going through things with his crew, still in his leathers, in the Ducati garage. He was on and off the bike, showing the guys how he wants the trailing edge of the screen to be so he doesn't clip it with his visor and how the seat foam could be a little thicker to raise him up further were just some minor, but actually all very important things that were discussed. Even Vito Guareschi was hopping on getting a feel for what Casey was talking about. All the mechanics were huddled around as they delayed packing up the GP10 into the flight case before it got shipped off to Motegi. So where did the pace come from? The brand new Aragon circuit was analysed by the Bologna guys and a computer-generated simulator to predict that pole would be 1m49.1. In truth their own number 27 GP10 clinched pole in 1m48.9. It all helped with so many things to get all the myriad of setting lined up for Stoner. "We come to the circuit and we have GPS settings and a 'big programme'," said Guareschi. "With this map we have a programme to determine the line and the speed through the corner and this is important for the gears as we don't have much time so it's important to have the 'box good; about within 5km/h." The bikes were fast in the dry, but they were also quick in the wet when it rained on Friday afternoon, but Casey only tried the new set-up on Saturday morning, meaning the bike was quick twice with two different set-ups. "With the new set-up he has more feeling with the front tyre. He has more grip and the bike is improving, more easy to understand. We tested many solutions from the test team. It's not necessarily the best, because it depends on the grip, the weather and this package works very well here. "When we go to Motegi we should be good on the brakes. When we get there it should be a lot more stable on the brakes." "I tested this set-up – not exactly the same – because we moved the rider this weekend. The balance, we have more weight on the rear tyre. We've moved the engine and the rear wheel further back. But, here this weekend, Casey wanted more body weight on the front. We put more foam under his bum and with this solution it's one more step. "We have a test at Mugello on Tuesday and Wednesday where I try the new 'Casey setting'. I'm very happy." There was also a new fairing that Ducati made for the pair of them but Casey didn't want to use it. Hayden did. It certainly didn't hurt Nicky because it improved his back straight speed by 2km/h. The confidence that has spread through the garage is what Ducati – especially with a certain Mr Rossi arriving to the fold in 2011 - needs. But Vito summed it up in a short, serious sentence. "I see for the first time since Qatar that Casey rode like Casey. There was only one time where he had a moment today but I think this set-up will give us a good opportunity." So HRC has said that it will have four factory-supported riders next year: Pedrosa, Stoner, Dovizioso and Simoncelli. Everyone should be happy, but two of them are not. Dovizioso is muttering that he should have a works team contract with Honda but HRC is going to make the Gresini Team an official HRC team anyway for 2011. All they are doing is changing the name above the door to satisfy the words of Dovi's contract. As soon as Livio Suppo joined HRC, they actively went out and got Casey Stoner, announcing him as early as July 9th. Pedrosa was never going to go anywhere else but strangely it took HRC until September 16th to announce his two-year deal. Why the delay? Stoner and Pedrosa are now the works riders in the works team for 2011 as it seems that there is not the money out there to fund a separate bike as was rumoured to be coming from Red Bull. The Austrians have never sponsored a team since the Red Bull WCM 500cc days came to an end in 2002, and less for sponsoring two races in the US and a helmet/cap deal with Pedrosa, Dovizioso and Kallio, they're a bit busy trying to win an F1 world championship at the moment. But it's still a shame that nothing could be structured for Honda. Both men are equally determined, forthright and ruthless. 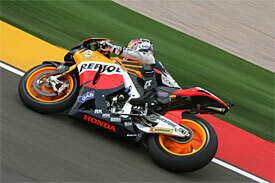 Pedrosa said at the weekend that nothing needs to be changed, "Right now the structure is working good. You can see at the beginning of the year we were struggling and now we are OK." Stoner got drawn into it by saying, "I think Livio's the best one in the whole paddock." Prepare for this one to run and run. It also emerged that the still-yet-to-renew-its-contract Repsol was siding with the Pedrosa/Puig side of the garage after this battle of minds, but hardly surprising as they have a hugely successful marketing campaign around Pedrosa in Spain. He is Spanish, for crying out loud! What Honda think of all this is not known, but what we do know is that Honda has been ruthless in the past to riders. What Honda is desperate to do is to win a title in the 800cc class - it only has next year in which to do it. Time is running out, so all of this arguing and finger pointing about who is going to ride in what team, what colour the bike is going to be and who should or shouldn't be in the garage favouring one or other rider is bad stuff. They need to make a bike that is usable for any riders such as the V5 990cc bike was. 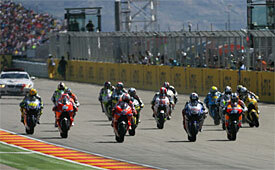 Hell, look at the nine riders who won on a V5: Rossi, Hayden, Biaggi, Ukawa, Gibernau, Barros, Melandri, Tamada and Elias. At the moment there have been only the two Repsol Honda riders to win on an 800cc bike after four seasons. Big difference that, but Yamaha keeps winning more races in a season than Honda has in the 800cc era and that's what wins championships. As I said, time is running out, so let's hope that HRC can sort out this apparent mess sooner rather than later because they need to get back to winning races rather than back stab over what is printed on a someone's business card. Besides, where else can Repsol go with Pedrosa now? There was a sneak preview of the 2011 calendar in the run-up to the Aragon weekend with the season looking largely similar to this year, less for Estoril moving around. The date that will have to change looks like being Le Mans as it clashes with Barcelona F1. But does it really have to change? Why don't the powers that be in Dorna just shuffle the schedule around a little just as they've done for the past Aragon weekend and for the remaining two European races with regards to free practice, ie; instead of three one hour sessions, four forty-five minute sessions have been made for the MotoGP class. It was a boon for most, and kept the all important qualifying session exciting because it was short and sweet and to the point. It also filled the ridiculous silence that was a Friday morning. So if there is a clash with the ever growing F1 calendar, why not have the 125 race on Saturday afternoon and then on Sunday morning the Moto2 race at 11 and the MotoGP race at 12:30 so the race itself is finished by 1:15, all in bags of time before the start of the F1 race at 2? This might be an idea, but only for the short term because in reality there will be streaming live feeds of all sessions and behind-the-scenes action all on the net in HD at a quality good enough to watch on your main TV screen, let alone laptop. All will be recordable or able to be put on pause as you can with many digital TV boxes. Go on Dorna, put a MotoGP race on the same day as an F1 race; maybe even more people will enjoy the grand prix double header? Would a merger save Formula 3?